Posted on July 8, 2016 at 9:59 am. 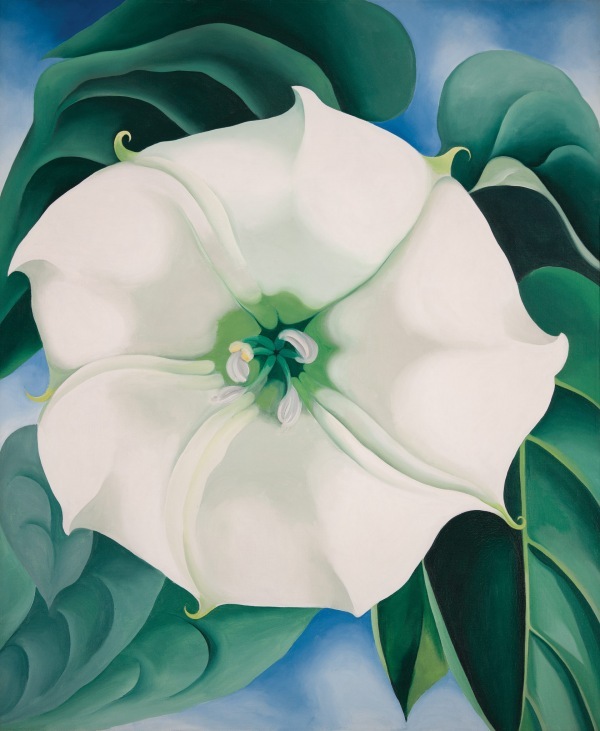 Georgia O’Keeffe’s 1932 Jimson Weed/White Flower No. 1 is just one of the over 100 pieces featured in the traveling O’Keeffe show. Image c/o Tate Modern. Some of Georgia O’Keeffe’s works are taking a trip to Europe in light of the Brexit. Just kidding–not really because of the Brexit–but over 100 of O’Keeffe’s pieces will be shown throughout Europe this fall. This marks the largest showcase of the late artist’s works outside of the United States. The O’Keeffes will make their first stop at the world-renowned Tate Modern in London and go on to Vienna, Austria and Toronto, Canada. Since even before her death in 1986, O’Keeffe achieved an almost-cult status in the history of American art. Some have nicknamed her the “mother of modernism” due to the fact that most of her work seems “modern my instinct,” according to her contemporary Marsden Hartley. Best known for her intricate and extremely detailed paintings of zoomed-in flowers, sun-bleached cow skulls, and numerous New York buildings, curators hope that taking a wide variety of O’Keeffe’s work abroad will expose viewers to just how varied her style really was. With such a long career (O’Keeffe was born in 1887), it’s surprising that only a sector of her work is widely known. O’Keeffe’s 1927 Oriental Poppies, included in our first grade “Flowers and Plants” unit, is also featured in the show. Image c/o Tate Modern. Since even before her death in 1986, Georgia O’Keeffe achieved an almost-cult status in the history of American art. Some have nicknamed her the “mother of modernism” due to the fact that most of her work seems “modern by instinct,” according to her contemporary Marsden Hartley. In addition to creating an incredibly varied body of work, O’Keeffe married big-name art promoter and photographer Alfred Stieglitz–which, aside for being great for business, contributed to the large number of iconic photographs we have of her (and, according to H. H. Arnason, helped build her status even more). Though critics came to write off O’Keeffe’s work as feminine if not overtly sexual–something O’Keeffe always denied–it was impossible to ignore O’Keeffe’s skill and popularity as a modernist painter. Also featured is O’Keeffe’s 1925 New York Street with Moon. Image c/o Tate Modern. Cody Hartley, the director of curatorial affairs at Santa Fe, New Mexico’s Georgia O’Keeffe Museum, stated that the show slated for the Tate Modern is “the most important O’Keeffe exhibition in a generation,” as it has gathered “the most important works from O’Keeffe’s career and covers the whole breadth of her creativity.” Like most artists that live a long time, O’Keeffe’s career is rich and complex. But the average museum-goer would be more likely to know about the different phases in Picasso or Matisse’s career than O’Keeffe’s–which is a real shame if not a downright outrage, considering her skill. Her paintings, O’Keeffe persistently stated, spoke for themselves, with no need to read anything else into them. One of O’Keeffe’s many detailed abstractions includes the featured Grey Lines with Blue, Black, and Yellow, c. 1923. Her early work in abstraction has earned her a spot next to artists like Kandinsky. Image c/o Tate Modern. The pieces featured in the show clearly do just that, in addition to boosting the claim that O’Keeffe is one of the most important American modernists of the past century. The show exposes a wider, more global audience to the breadth and variety of O’Keeffe’s works. So if you’re traveling abroad this summer and looking for some variety while still yearning for something American, why not plan to meet Georgia O’Keeffe? Check out more on the O’Keeffe show (specifically, the O’Keeffe show at the Tate Modern) here. The New York Times Style Magazine just ran a piece detailing a bit about Georgia O’Keeffe and her spouse Alfred Stieglitz. You can give it a read here. Now that you know that Georgia O’Keeffe is featured in our curriculum, are you wondering what exactly do we do here at the Art Docent Program? Find out more here! Dying for past issues of our blog? Fear not–you can find them here.